When my sisters and brothers and I would grow restless in the late afternoons of summer, we’d fight over who got to change the channels on the TV. Those were the days when one would actually have to get up off the “davenport” and turn a dial clockwise on the face of the TV and tune the TV by moving the antennas around until the horizontal lines stopped rolling! I think we only got 3 channels, so there weren’t too many arguments about what to watch. We thought that the reruns of I Love Lucy were hilarious. I even remember their address: 623 East 68th Street, Apartment 3-B. Lucy and Ricky Ricardo’s best friends and landlords, Fred and Ethel Mertz, were the perfect partners in crime. So, I was delighted to find Love, Lucy on the bookshelf of our local library. With Lucy as the author, she recalls her years in television with Desi Arnaz. She also includes her account of being blacklisted as a communist, memories of her children, and of course, her turbulent marriage to Desi Arnaz. 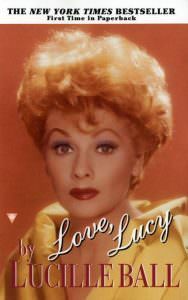 I Love Lucy has been called the most popular television show of all times. From 1951- 1952, our show changed the Monday night habits of America. Between nine and nine-thirty, taxis disappeared from the streets of New York. Marshall Fields department store in Chicago hung up a sign: “We love Lucy too. So from now on we will be open Thursday nights instead of Monday.” Telephone calls across the nation dropped sharply during that half hour, as well as water flush rate, as whole families kept glued to their seats. To purchase on amazon, click here. The re-runs kept The Noonan kids glued to their seats a decade latter. Something that made their parents very happy during the dog days of summer! To purchase this book from Barnes and Noble, click here.